As the digital landscape evolves, as does the way consumer brands approach endorsements and earned media. Over the course of the last five to ten years, we’ve become accustomed to seeing the sights of Kim Kardashian and celebrities alike grace the pages of our favorite brand channels in an effort to leverage a product’s popularity. And while that may have worked in the past, word-of-mouth marketing has made its way to the forefront of consumer interactions and loyalty. After all, we’re far more likely to try a product or service if our friends or a trusted blogger or influencer has a positive experience. With the increase of influencer and advocate marketing, content creators have the opportunity to work alongside their favorite brands in more genuine and authentic ways. This wave of influencer marketing has given brands the opportunity to connect with unique audience segments in a far more granular way. Thus, providing loyal fans and content creators unique experiences to leverage personal brand voice and aesthetics. So what’s the difference between a good brand and a great brand? Brand consistency. As a brand, and as content creators, it’s also very important to maintain brand image and consistency. Between visuals, messaging, logos, text, and colors, we enable audiences to quickly identify with a brand. The higher the quality of content, the more likely they are share and engage. Consistency helps brands and influencers manage perceptions, convey outlook and attitude, and eliminates any issues of brand confusion. The Photofy app has spent years devising the best tools for content creation - making it easier for influencers to create the content they need to market their message in the most appropriate visual ways. Photofy empowers influencers to create and share high quality branded content that best fit their brand. With a database of custom artwork, along with pro features for multiple users, the app makes it easy to seamlessly maintain brand consistency. Regardless of your design experience, users can simply create or re-share powerful imagery to meet brand guidelines, capture attention, convey information and drive engagement. So just how easy is it? 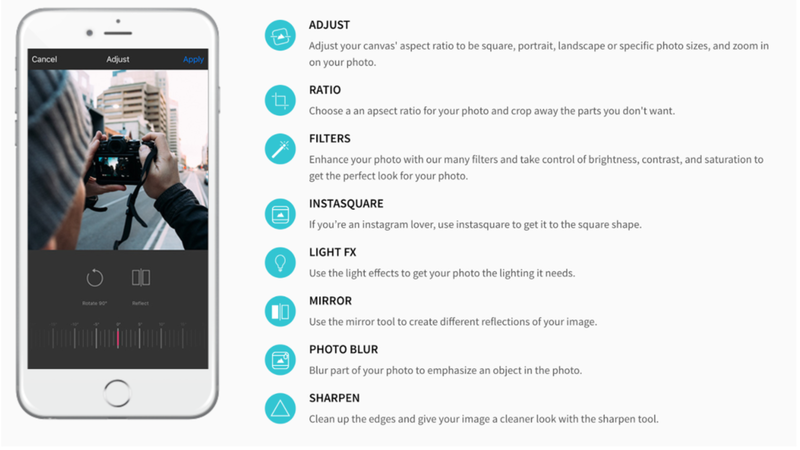 Photofy’s editor is designed to bring powerful digital editing to your fingertips. With basics such as color adjust, enhance, resize, crop, rotate and straighten along with many unique features such as light FX and photo blur. Get creative with an endless supply artwork, custom artwork, text options and include your logo for brand recognition! What makes Photofy unique amongst other photo editing apps, is the ability to add geo filters, utilize stock imagery and most importantly, share with ease to multiple social media accounts. So whether you’re a small business, influencer, brand advocate or individual with the aspiration to share with others, Photofy has something for you! Download the app now and let your creativity let loose.